If you have visited this resort not too long ago, why not add your own short review to this page? Access to the high point on the Klein Matterhorn mountain was massively improved by the opening of the new 28-seater Matterhorn Glacier Ride gondola which whisks you up almost 900m vertical in just nine minutes. It replaces the old cable car (which remains in place for emergency use), for which long queues were notorious. For the 2021/2 season, another identical 28-seater gondola is due to open to Klein Matterhorn from Testa Grigia above Cervinia in Italy. This will mean that Zermatt and Cervinia will be fully connected by cable cars and gondolas, making the journey easily accessible to pedestrians as well as skiers. The lift company introduced an Easy SkiCard (a points card where you pay by lifts used), an Hours Card (err, where you pay by the hours used) and priority boarding for the cog railway to Gornergrat (an extra CHF5 guarantees you a seat). And children under 9 get a free ski pass when accompanied by an adult with a multi-day pass. The rickety old gondola from Gant to Blauherd was replaced by a fast six-seat chairlift with over twice the hourly carrying capacity. Not before time (the gondola was built in 1971) but replacement had been delayed because the lift company had hoped to build a new piste to a lift in the Findeln area; but that proved unviable, hence the new chair at Gant. The new lift gives a much quicker ride and has cut queues. You must try Zermatt before you die. Few places can match its combination of excellent advanced and intermediate slopes, reliable snow, magnificent scenery, Alpine charm and mountain restaurants with superb food and stunning views. Its drawbacks are non-trivial (see ‘The downside’ on the left above). But, for us and for virtually all our reporters, these pale into insignificance compared with its attractions. Editor Watts has taken countless holidays here. Enough said. Zermatt started life as a simple farming village, developed as a mountaineering centre in the 19th century, then became a winter resort in the late 1920s and early 1930s. Summer is still as big as winter here. The village is car-free, but not traffic-free – electric buggies operating either as hotel shuttles or as public taxis zip around the streets. Residents and taxis can drive up to Zermatt, but the rest of us must park at Täsch (or more distant Visp) and arrive by train. At Täsch there’s a big car park (15.50 francs a day), and you can wheel luggage trolleys on and off the trains. Zermatt mainly attracts a well-heeled international clientele; the clientele is also relatively, er, mature for what is quite a sporty resort. The resort is a mixture of ancient chalets and barns, grand 19th-century hotels and modern buildings, most in traditional style but some decidedly funky. The oldest, most charming part of the village has narrow lanes and old wooden barns with slate roofs, many of them supported on stone ‘legs’. But the resort now sprawls along both sides of the river with a lot of new building at both ends and up the steep mountainsides. Arriving at the station, it all seems very towny, especially if there is no snow on the ground. The centre doesn’t have the relaxed, rustic feel of other car-free Swiss resorts, such as Wengen and Saas-Fee. The main street running away from the station is lined with luxury hotels, restaurants, banks and glitzy shops. The electric vehicles are intrusive, especially at busy times. There is a free ski-bus service; but it is inadequate at peak times, especially from the Matterhorn area at the end of the day. Electric taxis are pricey. You arrive at a fair-sized square at the north end of the resort, where you find ranks of electric taxis and hotel shuttles and horse-drawn sleighs. The cog railway to the Gornergrat sector starts from near the main station. The Sunnegga underground funicular for the Rothorn sector is a few minutes’ walk away. But the lifts to Furi and the other sectors (and the link to Cervinia) are over 1km away. Staying near the lifts to Furi gives swift access to three of the four sectors. But a more central location is better for the Gornergrat and Sunnegga railways and most of the resort’s shops, bars and restaurants. Some accommodation is up the steep hill across the river in Winkelmatten, which has its own reliable bus service. Zermatt’s emblematic, unmistakable Matterhorn is not visible from central parts of the village – if you want the famous view from your balcony, stay on the east side of the village, or at the south end – but once you are on the slopes its unique profile dominates the views wherever you go. And the cable car trip up to the Klein Matterhorn opens up vast panoramas, as well as close-up glacier views. Practically all of the slopes are above the treeline – a run served by the Sunnegga funicular is the main exception, and once you pass below the Patrullarve chair this is mainly a path to the village. A single piste map covers both Cervinia and Zermatt fairly clearly. In each sector there are runs, marked in yellow on the resort map, called ‘freeriding pistes’. These aren’t explained on the map but we are told they are marked and controlled for avalanche danger but are not groomed or patrolled. So don’t ski these alone, particularly late in the day. On Wednesdays and Fridays, you can get first tracks from Trockener Steg. For 42 francs you can take the lift at 7.40am, about an hour ahead of the herd, ski deserted pistes with a patroller, then jump the queue for one of the first cable cars to Klein Matterhorn and have a buffet breakfast at the restaurant there. We have done this for the last couple of seasons, thought it was fabulous both times and spent the rest of each day on Cervinia’s slopes. Our routine for the other days is to take the 8am train to Gornergrat and enjoy deserted pistes there and from Hohtälli before the hordes got up there. There are monthly moonlight descents from Rothorn with the ski patrol, including a fondue at the restaurant at the top (72.50 francs). Over recent years, service has improved to a high standard: polite and helpful lift staff; big boards at the bottom of each sector indicating which lifts and pistes are open in all sectors; useful announcements in English on the train and some cable cars; and free tissues at most lift stations. There are four main sectors. Rothorn is reached by an underground funicular to Sunnegga, starting by the river, not far from the centre of the village. The main nursery area is just below Sunnegga, reached from there by a miniature funicular. A chondola goes from Sunnegga to Blauherd, where a cable car goes up to Rothorn. The second main area, Gornergrat, is reached from Zermatt by cog railway trains that take around 30 minutes to the top – arrive at the bottom station early to get a seat (best on the right-hand side to enjoy fabulous views). The Rothorn and Gornergrat sectors, separated by the Findel valley, are linked by pistes and itineraries. The Matterhorn Express gondola from the south end of the village goes first to Furi (where you can change to another gondola to go to Riffelberg, for Gornergrat) and on to the small but worthwhile Schwarzsee area. The same gondola goes on up to Trockener Steg, focal point of the fourth sector, the super-high Matterhorn glacier paradise. The alternative jumbo cable car from Furi to Trockener Steg now works only in very busy times or when the gondola is closed (eg because of high winds). Above Trockener Steg the new 28-seater Matterhorn Glacier Ride gondola makes a spectacular ascent to Klein Matterhorn. At the top, you walk through a long tunnel to the highest piste in Europe. From Trockener Steg there are two ways to Cervinia (via the cable car to Klein Matterhorn or via two long successive draglifts). There are pistes back to the village from all sectors – though some can be closed or tricky due to poor snow conditions (and crowds). 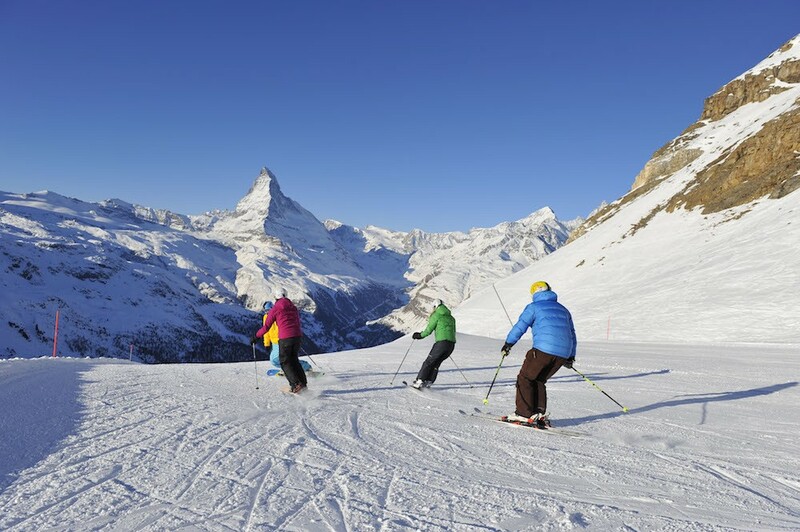 All Zermatt’s four sectors are well connected by fast chairs, gondolas, big cable cars or mountain railways. There are still T-bars on the glacier. The low speed of the Gornergrat train is something you just have to accept. Zermatt has improved its lift system hugely in recent years, eliminating major bottlenecks. But there can still be queues for the Hohtälli cable car from Gant. And the top section of piste from Hohtälli can get dangerously busy. The gondola to Trockener Steg is prone to closure in high winds, in which case the alternative cable car from Furi opens but may build queues. Snowpark, next to the Furggsattel six-seat chair has a variety of jumps, rails, rollers and a snowcross (but no half-pipe). A recent reporter ‘enjoyed the big kickers and nice bumps’ here but as another said ‘it is far away and very cold if the weather is at all bad’. In the summer, the park moves up to Plateau Rosa where a crew of six shape the 600m park daily; there’s a half-pipe and a good array of features. Zermatt has rocky terrain and a relatively dry climate. But it also has some of the highest slopes in Europe. As well as the glacier, two other sectors go over 3000m, and there are loads of runs above 2500m, many of which are north-facing. On repeated March visits we have been impressed by the snowmaking, in all four sectors, on pistes from above 3000m down to resort level. Piste grooming is generally excellent. There is some great off-piste when conditions are right, and the so-called ‘freeriding pistes’ include some excellent runs. But Zermatt doesn’t get huge snowfall, so you can’t always count on good conditions, particularly early in the season. The handful of black runs are not worthy of their classification, except for the odd steep pitch such as the last part of the run from Grünsee to Findeln (which can also be icy). 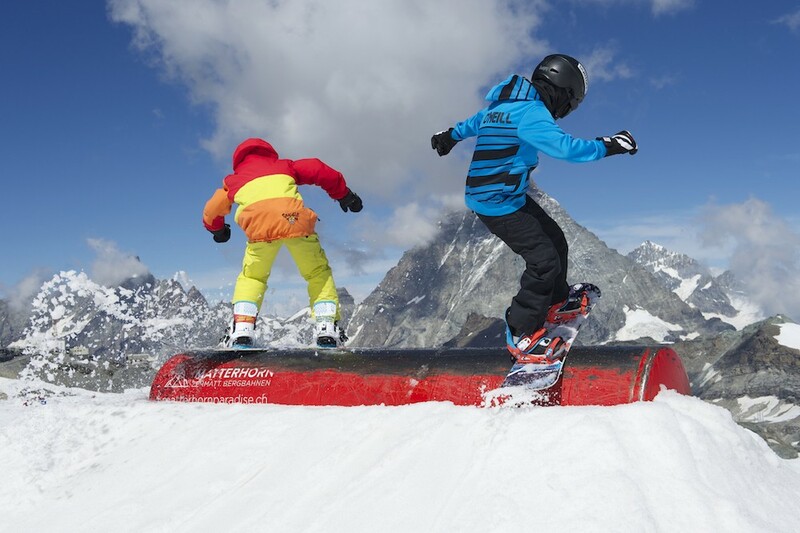 Zermatt is ideal for adventurous intermediates. Many of the blue runs tend to be at the difficult end of their classification. Reds vary unhelpfully: some are quite tough; some ought to be classified blue. Few are really what you might call ‘cruising’ runs. Among our favourites in the Gornergrat sector are the very beautiful reds down lift-free valleys from both Gornergrat (Kelle) and Hohtälli (White Hare) to Breitboden – we love these first thing in the morning, before anyone else is on them. The steepest part of Kelle is classified black, but an easier red variant bypasses it. From Breitboden you can go on down to Gant, or to the mid-station of the Findeln chairlift, or to Riffelalp on a run that includes a narrow wooded path with a sheer cliff and magnificent views to the right. On the Rothorn sector, the 5km Kumme/Tufternkumme run – from Rothorn itself to the Patrullarve chair – also gets away from the lift system and has an interesting mix of straight-running and mogul pitches (but it gets a lot of sun and lacks snowmaking). In the Matterhorn Glacier Paradise sector the reds served by the fast quad chair from Furgg are gloriously set at the foot of the Matterhorn. The Furggsattel chair from Trockener Steg serves more pistes with stunning views, notably the Matterhorn piste – blue in gradient for most of its great length, but classified red because of a short, steep pitch near the end that causes problems for many skiers. For timid intermediates, the best runs are the blues from Blauherd on Rothorn, and above Riffelberg on Gornergrat, and in good weather the super-high runs between Klein Matterhorn and Trockener Steg. Of these, the Riffelberg area often has the best combination of good snow and easy cruising, and is understandably popular with the ski schools. In the Matterhorn Glacier Paradise sector most of the runs, though marked red on the piste map, are very flat and include the easiest slopes Zermatt has to offer, as well as the best snow. Even an early intermediate can make the trip to Cervinia, via Theodulpass rather than the more challenging run from Plateau Rosa. Beware the black run from Furgg to Furi at the end of the day. It is not steep, but gets chopped up, mogulled in places and very crowded. A much more relaxed alternative is the scenic Weisse Perle run from Schwarzsee (the Stafelalp variant is even more scenic but has a short uphill section). The final red run from Furi to the village gets unpleasantly crowded. The main beginner area (with moving carpets) is at Leisee, just below Sunnegga, and reached from there by a short funicular. There is the special Wolli pass to get you to and from that area and allow you to ski the blue run down to Findeln; but other than that progression to longer runs is awkward – the slopes as a whole are very challenging for near-beginners, which includes fast learners who are ready to quit the nursery slopes after a couple of days. Of course, you can learn to ski here, but we would go elsewhere. The slopes are best for experienced freeriders and the main lifts are boarder-friendly: train, funicular, gondolas, cable cars and fast chairs. There are some flat bits, including on runs 27, 44, 52 and 69. The choice of restaurants is enormous, the standard (and prices) high – with the best serving food worthy of a top London restaurant. We list here only a selection. It is best to book – this is not a resort where it is always easy to just stop for a bite when you are hungry. Restaurants are marked on the piste map, but only a few places are explicitly named. The tourist office restaurant directory has photos, and clues about the style of food, but not prices. Beware: some places don’t take cards. 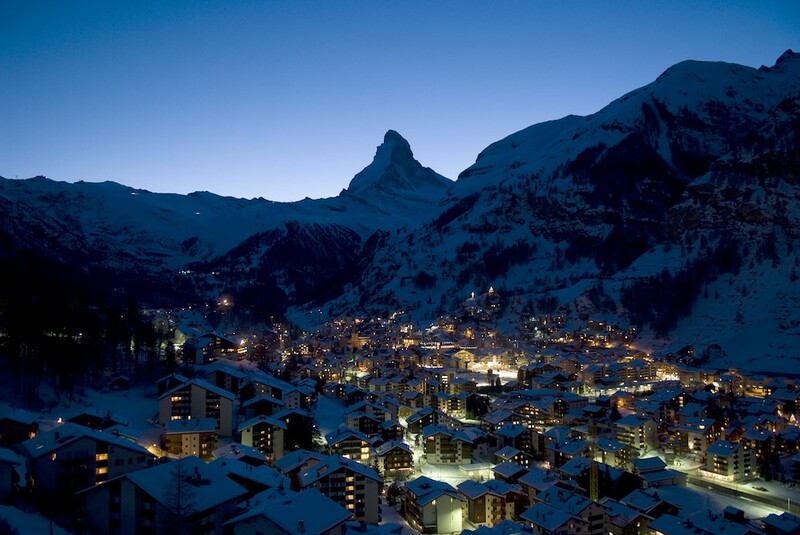 Below Sunnegga, at Findeln, are several attractive, expensive, rustic restaurants sharing a great Matterhorn view. Our favourites are Chez Vrony where service can be stretched but is reliably friendly and the food excellent; and Findlerhof aka Franz and Heide’s where we’ve had delicious lamb. Adler received rave reviews from two recent reporters (‘stunning views, food seems to get better and better’); spit-roasted chicken a speciality. Further up the Findel valley, in splendid isolation, Fluhalp is another favourite; excellent food and service, often with live music on the huge terrace – endorsed by two recent reporters. Up at Blauherd, Blue Lounge is a cool modern bar with sofas and a ‘super gas fire’, serving simple food such as tapas and ‘great burgers’ to jazz and other music. Over at Riffelalp, Al Bosco has a smart terrace and interior and, despite being part of the 5-star Riffelalp Resort hotel, is relatively affordable by Zermatt standards. We’ve lunched there several times and enjoyed the excellent service, daily specials, pastas, pizzas shaped like the Matterhorn and Riffelap Gamelle soup (a local speciality with spinach, potatoes, leeks, pasta and cheese, served in a metal bowl); on our 2019 visit we had delicious pappardelle with shrimps and succulent and moist spicy chicken. Nearby Alphitta is has good food, a lovely cosy interior, terrace with great views and live music most afternoons; expect a huge party on St Patrick’s Day as the place is run by Dave, an Irish musician. At Trockener Steg we like the Ice Pizzeria – a smart, modern table-service place with great views; delicious pizzas, as readers agree. The higher Gandegghütte is off the beaten track, has stunning views, friendly service and good, simple food. Over at Schwarzsee, we like the hotel: fab views, fairly simple and limited menu. Lower down, Stafelalp was smartened up and extended a few years ago and is now a cool place in a glorious position; fabulous lamb from its own flock of sheep. At Furi, restaurant Furri offers a really friendly welcome, good simple food such as rösti, a cosy interior and an interestingly fragmented terrace. Just above Furi, Mermottes has delicious food including some from the family farm and hotel Silvana has ‘good pasta and good service’. Below Furi, our favourite is Zum See, a charming old hut, and one of the best (and most expensive) restaurants on the mountain. Blatten has ‘delicious food’ and is run by a ‘nice family’. None in Zermatt but 15km of trails from Täsch to Randa (don’t count on good snow at these altitudes though). Our most recent reports on the main Swiss school have been positive (‘used for snowboard lessons, good standard of instruction’, ‘lovely instructor, good sense of humour’). Of the other schools, Summit and European Snowsport are staffed mainly by Brits. Summit was praised by a reporter whose daughter had her first lessons (‘we were really pleased with her progress’). We’ve also had reports praising European Snowsport (‘professional and accommodating’) and Prato Borni (‘high-quality technical tuition’). The prices, the general inconvenience of the place and the challenges facing beginners and near-beginners all work against families. But there are plenty of facilities for children, such as Snowli Kids Village and Kinderparadies, and we don’t doubt that they are thoroughly well run. The tourist office has a list of babysitters. ‘Choose your location with care,’ advises one reader.